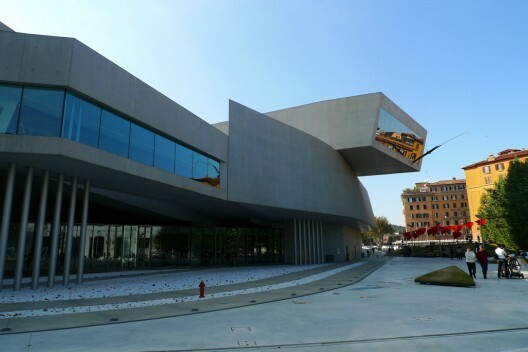 Just two years after its opening, the Maxxi Museum in Rome is threatened with closure. The country's current economic crisis has resulted in major cuts in cultural funding, causing a great deal of stress on the arts. As BD reports, earlier this month the museum was told that the government's contribution to its €11 million budget would fall to less than €2 million for 2012. Now, as the museum officials failed to set a budget for 2013, the government has reportedly begun proceedings to put the high-profile museum under special administration. Designed by Zaha Hadid Architects, the 2010 Stirling Prize winning national art and architecture museum has attracted more than 450,000 visitors per year. Hadid has described the museum's success as "remarkable", as it quickly built a prestigious, international reputation within the world of contemporary art. As reported by the Guardian, problems arose once the Italian government uncovered a €800,000 hole in Maxxi's 2011 accounts. Although the museum stated that this amount was offset by 2010 profits, the Italian government is considering putting the museum in the hands of administrators and will reveal the museums fate within the next few weeks. Projected losses for the museum could reach €11m in the next three years.